If you are trying to sell your home this spring, it's going to be more or less of a chore, depending on where you live. If your house is in Austin, Nashville, or Denver, it will probably sell quickly and you will likely get multiple offers. But if it's in a city where the market isn't nearly as robust, you might have to do something to set your home apart from the competition. The trick is to not overspend on improvements and upgrades, because you probably won't get that money back. However, real estate marketplace Trulia has offered some helpful tips, highlighting a number of inexpensive improvements that don't cost very much but will likely be appreciated by homebuyers. It starts with curb appeal, and surveys consistently show that an attractive front door makes a big difference with buyers. Take a look at yours, and if it's old and faded, with chipped paint, consider a face lift. Better yet, consider replacing it altogether, with attractive new hardware. 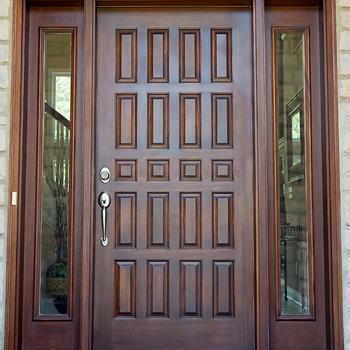 You can purchase an attractive fiberglass door for between $250 and $350 at a home center store. Even with professional installation, the cost will be below $1000. How do guests arrive at the front door? If they have to walk on stepping stones, or a pattern of brick pavers that have sunk into the ground over time, consider adding a sidewalk. A sidewalk doesn't have to be concrete, though that's a good choice. It can be brick, or even crushed stone. The important thing, Trulia advises, is that it match the style of your home. Another important, and cheap outdoor improvement is to spruce up the landscaping, especially in the front of the house. Cut back shrubbery that has gotten too tall and is making contact with the side of the house. Invest in a few bags of fresh mulch to place around shrubs and you've spent very little to make a good first impression. Inside, the the kitchen and bathrooms are very important factors, but total upgrades can break the bank and not provide much, if any return. However, there are inexpensive upgrades you can do in both areas. Nothing dates a house like old fixtures, so replacing lights and faucets in the kitchen and the bathrooms can brighten up both areas. Replacing an old toilet with a stylishly designed new one may also make economic sense. If the bathtub is stained and chipped, consider an inexpensive reglazing to make it look new again. Finally, if your thermostat is old and has an analog dial, consider replacing it with a new digital one. Better yet, choose a digital thermostat that can be easily programmed to adjust heating and cooling throughout the day. With heating and cooling costs taking a big share of the typical household budget, this money-saving improvement could be very appealing to a prospective buyer.